NZOZ Protetyka Twarzy \n" +"\n" +"
Customed prosthesis of eyeball and epibulbar prosthesis for children and adults. The prosthesis are made of acrylan material. Each prosthesis has customed-drawn iris on the basis of the second one. The shape of the prothesis is obtained by the acqusition of the functional impression of conjunctival sac. Due to this method the expected mobility of the eyeball prosthesis is satisfied. Moreover, it stimulates proper forming of orbital cavity and development of soft and hard tissue surrounding orbital cavity. The application of this method is of primary importance when dealing with patients in development age. eyeball prosthesis with eyelid, parts of cheek, nose and upper lip. These prosthesis are made of soft MG silicone material dyed to match the colour of the skin. The shape of the prosthesis is produced in order to obtain a symmetry with respect to the other half of the face. Therefore, it gives a significant cosmetic result. The ectoprosthesis have been fixed to the spectacle rims in Poland for several years. It is an insufficient technique which does not provide firm fixing of the prosthesis. Currently, strong emphasis is put on the application of the new method. It is based on fixing the ectoprosthesis with endosteal implant and phenomenon of osseointegration. Such a fixing improves the stability of the ectoprosthesis and adherence to the prosthesis area. Thus, the comfort of use is higher and the cosmetic effect is outstanding. To sum up, it is of vital importance for the mental state of the patient. In addition, it makes it possible for the patient to regain their confidence and be able to return to their work and social life. 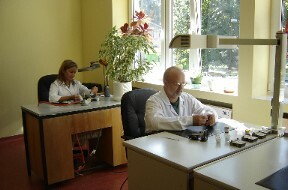 As far as implantology is concerned, NZOZ co-operates with International Centre of Hearing and Speech in Kajetany, Poland. Due to this cooperation the fixing of ectoprosthesis with implants has been performed succesfully many times. The treatment of children for developmental anomaly in the neighbourhood of eyeball and orbital cavity- microphthalmia and congenital eyelessness. In this case, special mandrins and expansion systems are made. The proper shape, size and force of pressure produce correct growth and development of soft and hard tissues in the neighbourhood of orbital cavity. Due to this method, one may obtain a satisfactory cosmetic effect during the production of eyeball prosthesis in future. Rings- responsible for sustaining space in the orbital cavity. They are made before the plastic surgery in the neighbourhood of orbital cavity. It caters for patients who suffer from neoplastic change or are after treatment with ionizing rays, which resulted in enshallowment of recess of conjunctival sac. The fixing of the rings protects against adhesions and sustains space for future eyeball prosthesis.